With a long standing tradition in providing timeless little girls swimwear with superior quality, Isobella and Chloe is always one of our top brands. Discerning moms and grandmothers adore that every design portrays a classy lifestyle and is sure to get a big smile when their little darling first sets her eyes on her new Isobella and Chloe swimsuit. For fall and summer, you can be sure that their collections will be filled with frilly dresses and matching styles that make coordinating sister outfits a breeze! 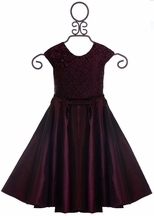 Families love to buy Isobella & Chloe for holiday photos or shared birthday parties. Let�s talk a little more about the brand. Every design from Isobella & Chloe is first conceptualized in Los Angeles, California. With a dedicated team, many creative minds come together to make sure every collection and each individual piece is perfect! We love that this is a family run company. From design to manufacturing, involved family members make sure that the clothing maintains the company�s high standards in quality and values. We love that the owner�s parents are integrated into the culture where production takes place in Vietnam. They know every seamstress and are proud to bring an appealing career option to the people of this city. Unlike other companies that produce their products overseas, Isobella and Chloe is hands on in the manufacturing, and we certainly love that! For spring and summer, the Isobella and Chloe line fills with beautiful swimwear for kids. As we await our spring 2017 shipments, we cannot wait any longer to update all of our customers with all of the excitement in store. So many fun collections of swimsuits are poised to hit our shelves and we are here to give you the inside scoops on every look. We know that the Liberty Belle collection will be one of our most popular. With several different styles from one pieces to bikinis for tweens, this collection is ready to get her in the Independence Day spirit. We know many of our customers have a tradition every July and we are happy to provide perfect Fourth of July swimsuits for your girls. There is something for any girl size 2T to 14. You can never go wrong with Red, White and Blue for summer swimsuits. Are you looking for something off the beaten path for this Patriotic holiday? We have just the collection for you. Be sure to check out the cute styles in Isobella and Chloe�s Cherry Glaze collection. With pops of bold red, these swimsuits for girls also feature blue, although it is a light sky shade. Talk about a fun twist for our traditional Fourth of July colors! For those of you who have tropical vacations planned, don�t worry, there are collections waiting to delight your daughter and they will be the first thing she packs! A bright and fun design, the Mango Delight collection for spring 2017 will get her in the spirit of vacation, whether you plan to cruise the ocean or spend a week on the beach! These swimsuits have a light melon orange blended with bold turquoise and bold pink in an exotic flower print. If she is looking for a beautiful floral print swimsuit, the Wisteria collection holds the perfect option, the Isobella and Chloe Spring 2017 Flower Swimsuit. We love the way sunshine yellow pops out of the rich pink flowers! For your charming daughter who adores all things girly, we suggest any of the sweet pink collections. There are several to choose from, whether she loves the daisy print on Cupid Cutie designs or the sheer overlay and added flower accents found in the Precious Bloom collection, we know that we have a style just for her!